"The places of the poetic continent are not physical places. They map the internal regions and contours of the inner human being that lives in a cosmos of other beings and life forms. They constellate the places of the soul." This collection of poetic, philosophical and literary texts and full-colour images offers an ATLAS of the Poetic Continent - a treasure to study, contemplate and inspire action in the world. This ATLAS grew out of a social sculpture process in a city that invited its citizens - individually and collectively - to enter into a process of active reflection on the question "what am I doing in the world?" This project confirmed that the connection between inner and outer work, and the inner workspace, is central to all social sculpture processes. The maps for this poetic continent open up pathways that enable us to "come to our senses". Discovered only in our engagement with the world, and inspired by the constellations of the soul, they offer distilled understandings on the path to a new society: a viable future of free, humane and ecological citizens. SHELLEY SACKS is an international practitioner of social sculpture, working in connective practices, exploring the relationship between imagination and transformation and rethinking responsibility as an ability to respond. She regards her long-term collaborative projects - such as Exchange Values, University of the Trees and Earth Forum - as "instruments of consciousness" and flexible frameworks that link inner and outer processes. Her work includes more than 40 "actions", site works, installations and social sculpture projects; several essays and books, involvement in grassroots cultural and political organisations; facilitating social sculpture processes in the 1970s and 1980s in South Africa; and collaborating with Joseph Beuys for more than a decade in the Free International University. Shelley is Professor of Social Sculpture and Director of the Social Sculpture Research Unit at Oxford Brookes University, Oxford. 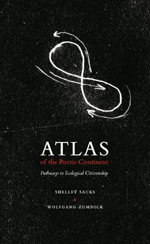 The ATLAS is one of several collaborations between Shelley Sacks and Wolfgang Zumdick. DR WOLFGANG ZUMDICK is an international author, philosopher, curator and a specialist in Social Sculpture and the work of Joseph Beuys. He was a scholarship holder at the Laurenz Haus Foundation, Basel, and has curated several Joseph Beuys and Social Sculpture exhibitions. He is the author of numerous publications on the history of philosophy and twentieth century art and philosophy, with a specific focus on Joseph Beuys and the philosophy of imagination. He is Senior Lecturer in Social Sculpture at Oxford Brookes University, Oxford, and has been a guest lecturer at numerous universities worldwide. He is active in the Social Sculpture Research Unit and collaborates with Shelley Sacks on writing and practical projects such as University of the Trees.